How to find a profitable niche based on existing products. Which domains you'll need for this trick to work. See the domains I bought for this case study. Hosting - DNS & Indexing... Follow these steps for super fast site indexing. Site Hub - Using a pre-sell - Sticky page and site wide linking. Ultimate Native Ads is a video course I initially developed to be included on the Udemy platform but due to a small lighting issue (very slight) decided to release limited copies here (100) while I make edits. 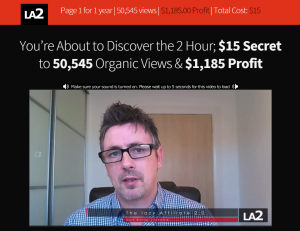 Details: How to make affiliate commissions quickly and without a website. This is without doubt one of the quickest and easiest ways of making money online. This works because people commit themselves to reading what you have to say and are more inclined to click your native link. Now think what you can achieve if you apply yourself to this one simple formula for a week, two weeks, even 3 weeks… 10 silos, 20 Silos, 30 Silos! An easy to replicate method that can make you $100s every month for the next 12 months or more… without any additional work or cost! A Simple but deadly effective SEO formula, which forces new sites to the top of search engines and sticks them there! One little known trick (which takes only a few minutes!) that will future-proof your website and rankings against ANY Google updates & keep you on top! And the secret sauce; SEO Sequencing… Knowing the correct sequence of tasks transforms new sites into traffic magnet authority sites fast.